Orlando, Fla. (April 6, 2019) – An estimated six to 15 million people in the U.S. are children born of a pregnancy complicated by preeclampsia. New research performed in rats reveals that treating preeclampsia with sildenafil citrate (Viagra) may help protect the cardiovascular health of the offspring. Preeclampsia occurs when women with otherwise normal blood pressure experience elevated blood pressure during pregnancy. Children of women with preeclampsia during pregnancy have higher blood pressure during childhood and almost double the risk of stroke later in life. Turbeville will present the new research at the American Physiological Society’s annual meeting during the 2019 Experimental Biology meeting to be held April 6-9 in Orlando, Fla. In previous work, the researchers found that sildenafil citrate, which lowers blood pressure by acting on the nitric oxide pathway, can treat preeclampsia in a rat model of the condition while also decreasing blood pressure in offspring. In the new work, they wanted to determine how sildenafil citrate affects the offspring’s response to stressors that normally increase blood pressure. To mimic human preeclampsia as much as possible, the researchers used a rat model that develops the condition without a procedure or drug. They then exposed the offspring to a stressor that increases blood pressure. The researchers observed smaller increases in blood pressure for male offspring of rats treated with sildenafil citrate compared to those that did not no receive treatment or received a more commonly used blood pressure medication. The protective effect was not apparent in female offspring. The researchers are working to better understand the gender-specific response to sildenafil citrate. They are also exploring whether the improved response to stressors leads to decreased risk of chronic diseases such as high blood pressure and chronic kidney disease when these offspring become adults. 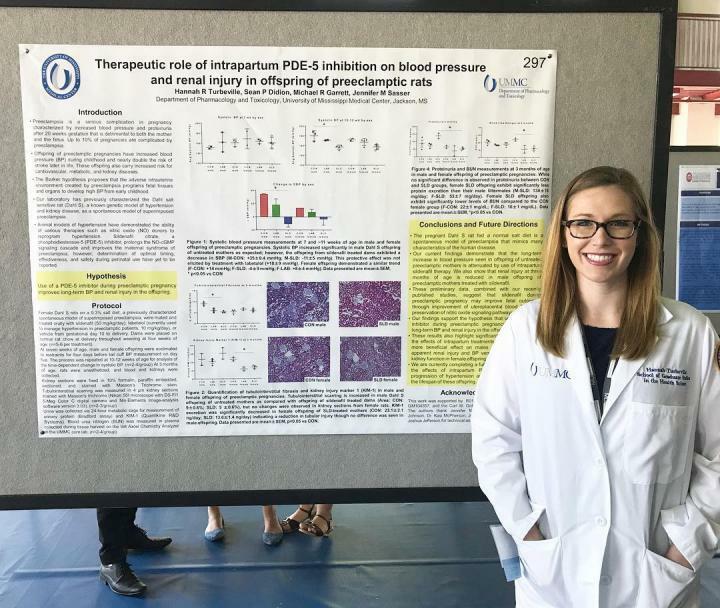 Hannah Turbeville will present this research on Saturday, April 6, at 2:30 p.m. in the Plaza International Ballroom G, the Hyatt, and on Sunday, April 7, from 10:15 a.m. -12:15 p.m. in Exhibit Hall-West Hall B, Orange County Convention Center (poster E569 574.10) (abstract). Contact the media team for more information or to obtain a free press pass to attend the meeting.